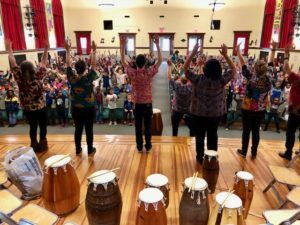 Montclair State University’s African Drumming Ensemble performed at a special assembly on Wednesday at Seth Boyden. The show marked the start of our district’s music partnership with the John J. Cali School of Music at Montclair State University. This entry was posted in Events, PTA, School, School District, Seth Boyden News, SOMA. Bookmark the permalink.